Blowout Sale! Save 51% on the Toddler Forks and Toddler Spoon Silverware Set | Toddler Utensils with Toddler Fork and Baby Spoon| Spoon for Toddler | Baby Fork and Baby Spoon Travel Utensils with Case |Toddler Silverware BPA Free by Lullababy at Foom App. MPN: unknown. Hurry! Limited time offer. Offer valid only while supplies last. BONUS TRAVEL CASE: A diaper bag might not be the cleanest place in the world. While traveling, your toddler's utensils will touch every bit of gunk and goo in the bag which eventually will end up in your toddler's mouth. Our bonus travel case ensures that no matter what is in your diaper bag, your toddler's utensils will stay sparkly clean. 100% FOOD GRADE STAINLESS STEEL: Parents can be at peace knowing their toddler's utensils are safe and are BPA, Lead, Latex and Phthalate free. The 100% food grade stainless steel material is durable and easy to wash off stubborn grease and oils. Unlike many toddler utensils that have uncomfortable and thin handles, Lullababy's toddler forks and spoons have comfortable, hourglass shaped handles that are perfect for small delicate hands. ERGONOMICALLY DESIGNED TODDLER UTENSILS: We only use what works. We created ridges on our toddler fork tines so the food makes it to your toddler's mouth. Our toddler spoon is designed with a deeper spoon bowl to make scooping foods and liquids easier. We understand toddlers are transitioning from their hands to utensils and we want to make this process smooth and safe which is why our toddler utensils have all rounded and no sharp edges. LIFETIME WARRANTY: Our product is guaranteed to last while your toddler is still in diapers and beyond. If for any reason you are not satisfied with your purchase, please let us know and we will either replace the product or provide a full refund. We promise this forever. MAKE MEAL TIME FUN: We challenge parents with even the fussiest eaters to try our innovative and safe toddler utensils. 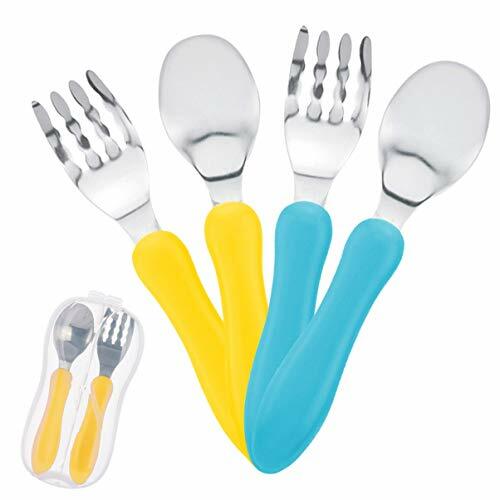 This set includes: a sky-blue fork and spoon, a sunshine-yellow fork and spoon, as well as one bonus travel case. Each set is dishwasher safe, BPA free and designed to make meal time fun! These make a great present and are the perfect baby shower gift. If you have any questions about this product by Lullababy, contact us by completing and submitting the form below. If you are looking for a specif part number, please include it with your message.